Whether you are a general contractor in need of quality subcontractors to complete your project, or a subcontractor looking for additional work, we have a solution for you. With the current economy it is more important than ever to have a very deep pool of both current and future bidding opportunities. The most informed contractors always maximize profits. Why do generals post their projects? Their usual sub has retired or has gone out of business. Quality of workmanship or pricing is lacking. Amount of projects is more than current subcontractor base can handle. The BEST generals in the industry are always strengthening their sub base, just like the best sub's are always looking for new opportunities! Our flat rate pricing is $200 per month with unlimited bidding opportunities. Turn on or off your leads as your work flow demands and pay as you go. Take a free 1 month trial of our service and see how Construction Pipeline can put you in contact with some of the best active general contractors in your area! Our high quality leads will get you projects now and in the future, helping you to establish valuable relationships and repeat business with GC's looking for a sub in your trade. Only licensed contractors may participate in our program either to post projects or receive project leads. Subcontractors create a profile of project types, trades and geographical areas they cover. The projects are then routed based on our internal feedback. The companies with the highest feedback always receive the leads first. We follow up with all projects that have been posted to receive specific feedback and status updates on the projects. Only 3 competing companies will receive a project lead. General contractors are not bombarded with unnecessary calls so that our subcontractors have a legitimate chance of landing projects. There is no need for lead replacements. We offer an unlimited amount of leads and because we speak directly to the person in charge of hiring for a project, we usually send the lead within minutes of us getting off the phone and the general is waiting for our subs to give them a call. Our focus is your success, and a long term relationship with general contractors is the key. It isn’t about just landing one project from our leads; rather it’s about building a solid relationship with a general that will use you on job after job. Lining up future projects is the most important thing you can do for your company. A regular supply of qualified bidding opportunities will guarantee you both work for today as well as projects in the future. 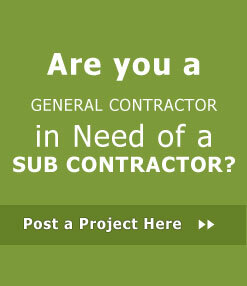 Most general contractors only replace a few subs in any given year. Finding timely opportunities is really just a question of timing. We will put you in front of the right guy at the right time! Our 100 percent US based, industry savvy, client service team is here to assist you. We are knowledgeable, friendly and dedicated to your success. All projects must be privately funded. We are not interested in any form of publicly funded work including federal, state, and county projects. Our focus is on repeat business and not just the lowest bid mind-set of government work. Since 1992 our staff has provided quality project leads to our clients. You are in complete control of your account. You may place your account on hold or cancel at any time with no early termination or other fees. General is contacted by screened pros. Our high quality leads, with a true replacement guarantee, will get you projects now and in the future. Subcontractors testing out our system. Tire kickers, project leads that don’t actually have a current project. All obviously bad web form submissions. Once a project leads has been submitted and verified an email notification is sent based on the established routing criteria of the pro including project type, geographic area, and trade. We NEVER will send out more than 3 companies per trade requested. General contractor is contacted by subcontractors. After the emails are sent, subcontractors contact the general by phone to discuss the details and scope of the work required to complete the project. Approximately 2 weeks after each project lead is sent we follow-up with the general contractor. Feedback is determined not only on the successful completion of awarded jobs, but on the entire sales process. Through this proven system we are able to cultivate relationships between general contractors with ongoing work, and deserving subcontractors who have demonstrated a track record of quality.